Bailey is a little streaker. She loves to run naked through the house every night in pure glory. She is hilarious. She takes off like a rocket ship after toweling off, and runs as fast as her little feet will allow through the house yelling, “I’m streakin’! I’m streakin!” It’s a sight to see. She makes us laugh. She’s becoming a beautiful little girl, and a handful all at the same time. Her language skills are developing at an amazing pace. Instead of 3 or 4 word sentences, she’s now using 6-7 words or more. She repeats everything you say (uh oh, watch out!) and she asks lots of questions, which is typical. She’s also asserting herself more, which is to be expected. Her latest thing is not wanting to eat her food, but she doesn’t realize that Mommy is not a short order cook. She’s even flung her food at the sitter, and loves to test Daddy at the table by throwing a fit. That said, she’s learned “hungry” is not a great place to be, and when hungry, she’ll eat with no complaints. Two days ago she came to me in bed and said, “I love you momma.” All on her own. Completely spontaneous. It made my morning. She also loves Daddy to throw her up in the air, and she squeals with delight when she gets to do “flying baby”. 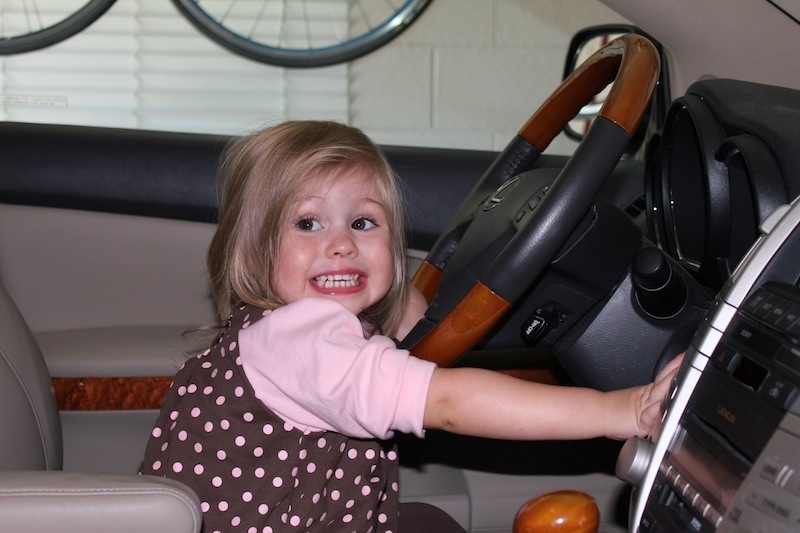 She’s also become fascinated with driving, and loves to sit in the front seat of the car and pretend to steer the wheel. It’s now a daily request to go driving, and she exclaims heartily, “I LOVE to drive!” Her Uncle Shawn has been visiting the last month, and she has thoroughly enjoyed seeing him. He makes funny faces at her, which she is truly fascinated with. He also plays with her and she enjoys the fact that he is like a big kid and gets down on her level to play with her. It’s sweet to watch and we enjoy watching her with him. These are precious, endearing moments to be treasured. I want her to know and love her Uncle just as much as he loves her. Tomorrow is Thanksgiving and it promises to be a packed day with family. Granny has reserved a bounce house and there will be plenty of activities for all the kids. With 42 people (most of them kids), it’s sure to be a great day of memories. Here are some recent pictures!